Christmas is coming, now now now. The frightening onward march of time that leads inexorably to actually having to sort out gifts for like, everyone, at Christmas, is NOW. So I've made a few gifts with fabric, paint & lace applique which should cover most of the girl portion of my gift list, PHEW. The inspiration for this came from another DIY jobbe I saw a while ago on one of my fave blogs, Honestly WTF: DIY lace Mickey Mouse Ears, which in turn been inspired by the fantastic headbands of Maison Michel. I love it when things go 'round. My idea? 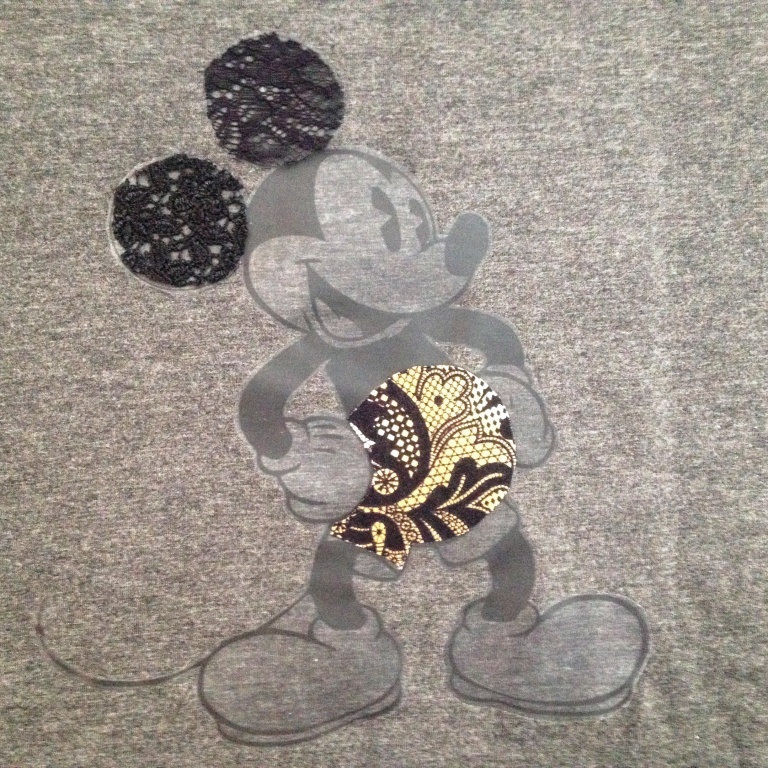 Very simple: a t-shirt with lace applique, which much to my surprise, I can't find already done on somebodies blog but maybe I just haven't found it. Do let me know if you've seen this somewhere before, as I say, I'm surprised its not out there. A length of lace at least 20 x 40cm. Print of Mr Mouse from the plethora of images out there. A4 iron on transfer sheet. You will need a picture of Mouse, so printer actually necessary. Scrap of lace & optional contrast fabric. * DO pre-wash, dry & iron the t-shirt or beware of fabric shrinkage. If you have ALREADY BOUGHT a t-shirt, which I wholeheartedly recommend, you're good to go. Most unfortunately, I couldn't bleeding well find a nice enough plain t-shirt to just do this job easily, so with MUCH haste and irritation, I made a few. These are gifts from the heart, yo. Follow the directions as to printing & transferring the image to the shirt, or at the very least, give them a cursory glance; usually its a simple case of hot dry iron + pressure but be on the safe side & check! To transfer the image for painting, I used Saral transfer paper, very handy stuff to have around the studio. Use a few bits of tape keep the fabric stretched taut or use a really great screen printer's trick I picked up; use adhesive plastic book covering film behind! Just peel the backing paper off a sheet of Contact & tape the film sticky side up onto your work surface or a wooden board, or whatever hard panel you find that fits inside your t-shirt, behind the area you'll be painting. Position the area of fabric to be painted onto the tacky base board and hey!..The fabric is kept smooth and unmoving but is easily repositionable and the sticky panel is endlessly re-useable. Trace, pressing firmly using a HB pencil..
To furnish his look, make a template with tracing paper of the ears and shorts, including the buttons. Cut out the shapes & use these as a pattern. Decide which area of the fabric pattern you want for his trousers, then lightly mist the back of the paper template with spray adhesive so its tacky enough to keep the pattern in place. I like the rough edges of lace seen on the Maison Michel ears, kind of a cool/tough edge, so I cut mine very approximately around the ear circles. Cut out the buttons on a contrasting bit of fabric but keep the template for positioning. I like to use a fine paintbrush to dot the fabric glue where needed, it's more accurate & controllable. 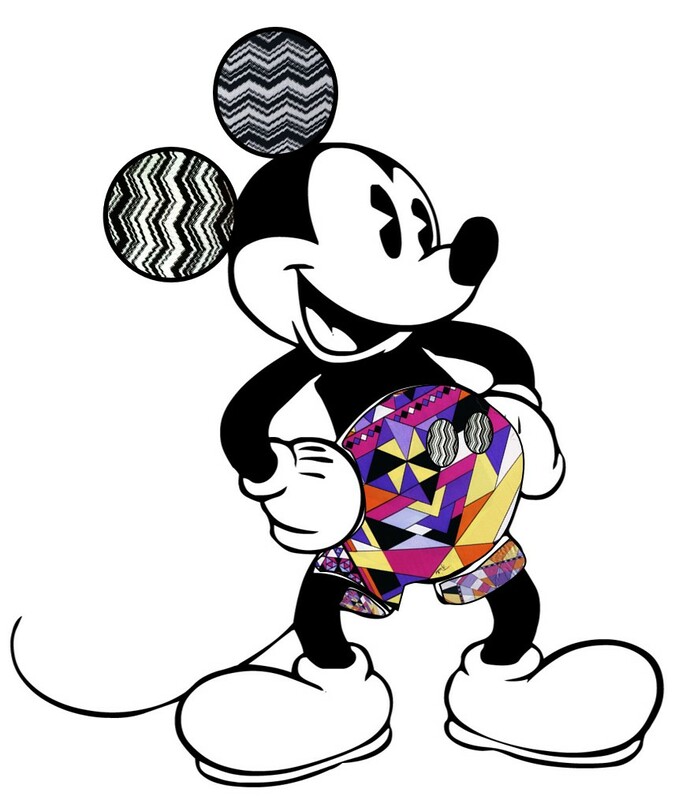 Or stick with so hot right now plaid or mix it up with Missoni & Pucci, babe. Dude looks like them's some good drugs. Mickey Mouse eh. So cool. Can we have a Miley picture? Why certainly! Especially when Marc Jacobs looks so adorable. 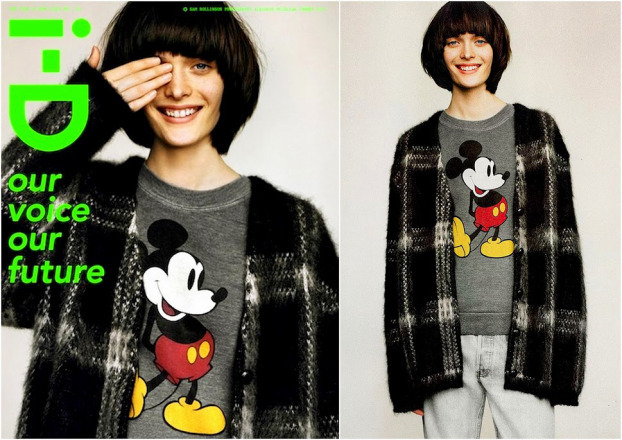 I came across many, many images of Mickey Mouse shirts in fashion - see a whole load in one article, here - but none, like NONE of him with lace ears which continues to amaze me. Then I had this GENIUS idea: doily ears, yeah! Oh yah, you saw it here first. Watch OUT, 2014; artworkerprojects will rip it up, babe.